The Belmar Arts Center invites all members, renewing members, and new members to submit a proposal for consideration of their work for inclusion in a three-person exhibit. Three artists will be chosen by a BAC committee based on the quality and consistency of their body of work. Each artists should be prepared to exhibit five-seven works, at least three of which must be for sale. Belmar Arts will retain a 25% commission fee on sales. 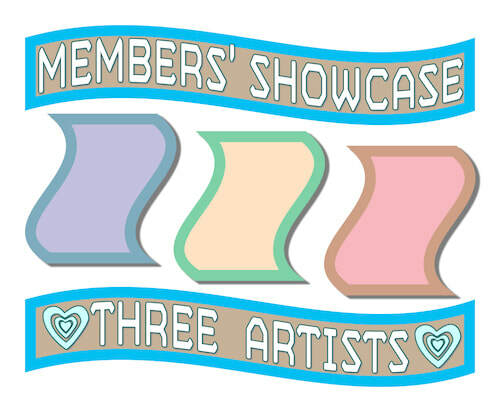 The three artists chosen must be available on November 24th to deliver and install their own work in the gallery. Membership is required for consideration for the exhibit and can be added during checkout. Open to all member artists, 18 and older, all media. Membership must be current when the proposal is submitted or added at checkout. All works entered must be original creations by the artist. Five to seven works by each artist must be exhibited during the entire show. Three of those works must be for sale. Works cannot be removed from the exhibit before the ending date. Each artist will write a one page Artist’s Statement that will be exhibited alongside their work. To enter, fill out the entry form on this page and submit three to five images that will be used for judging. The image can be a jpeg, png, or tiff. To resize your image, open it in an image processing program and change the dimensions to between 800–1200 pixels on the largest side. Do NOT submit thumbnails (less than 800×800 pixels). Change the resolution to 72dpi. Make sure the resulting file size is less than 1Mb. (if you do not understand image types or image resizing, read this set of instructions: Image Help). Since the selection of the three artists will be based on the images you submit, your images MUST follow the instructions above or your proposal will not be viewed. NAME YOUR IMAGE THIS WAY (PLEASE): Name your image file BEFORE you upload it to the entry form using this format: yourlastname-theentiretitle. Do not add any other information to your image name. Do not add additional dashes, do not use underscores, or any other symbols. Your work must be hand-delivered to the Belmar Arts Center at 608 River Rd, Belmar, NJ 07719. Belmar Arts is not equipped to receive or return parcels sent by mail or delivery service. You must be available to install your own works on Saturday, November 24th at the times designated. BAC will supervise the installations and designate spaces for each artist. Your two-dimensional works must be wired properly and securely for hanging: no saw tooth hangers, cleats, string, or tape are permitted. Wires MUST be attached to the frame, not to a backing board. Improperly prepared works will not be installed and could result in losing a place in the exhibit. A 25 lb. maximum weight for work intended to be hung on the walls including hardware and/or armature. Three-dimensional work can be freestanding or displayed on a pedestal. You do not need to provide a pedestal unless a special size is needed. Sculptures should be no more than 50lbs. Any media equipment required for an installation (video, sound, etc) must be provided by the artist. Art sold is subject to a 25% commission fee. Sales tax will be added to the price of work sold. Remittance of NJ Sales Tax will be handled by Belmar Arts. All artists with sales commissions of $600 or more per calendar year are required to furnish their SS# or Tax ID# to Belmar Arts. A 1099-MISC for taxable income will be issued by Belmar Arts for sales commissions of $600 or higher. Commissions are paid at the close of the show. Belmar Arts will make every effort to treat your artwork with care. However, work is submitted at the artist’s risk. Belmar Arts and the Art Show Committee will not be held liable for lost or damaged work. Artists are responsible for insuring their work from delivery to pick-up. Belmar Arts reserves the right to use digital images of exhibited artworks for the sole purpose of promotion of this exhibit and Belmar Arts on social media, websites, and advertising. Late Pick-up Penalty: If you cannot pick up your work during the advertised time, you must arrange for someone else to pick it up. Work left beyond two weeks after the advertised pick-up date will be considered abandoned. Abandoned work will become the property of the Belmar Arts and will be sold to benefit Belmar Arts. Name your image file BEFORE you upload it to the entry form using this format: yourlastname-theentiretitle. Do not add any other information to your image name. Do not add additional dashes, do not use underscores, or any other symbols.